Bout Tree Fiddy, under jockey Russell Vicchrilli, rolls to victory in the $117,780 Rocky Mountain Futurity Sunday afternoon at Arapahoe Park. AURORA, CO�JULY 10, 2016�Bout Tree Fiddy got away alertly under jockey Russell Vicchrilli then drove to a one-length win over In Kuh Hoots in the $117,780 Rocky Mountain Futurity Sunday afternoon at Arapahoe Park. Who You Know finished a nose back for third. Tomey Swan conditions the IVORY JAMES gelding for owners Patrick Swan and Carry Allred. Bout Tree Fiddy completed the 350 yards in :17.387 seconds with a 10 mph tailwind to earn a 102-speed index. The Oklahoma homebred, from the Fredricksburg mare Hollie Jollie, got his second career win in five starts and used the $47,112 winners' purse to boost his career total to $68,496. 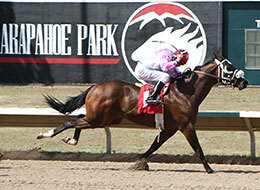 The brown gelding was also third in the Laico Bird Stakes at Remington Park in April. Also a homebred, In Kuh Hoots races for owner/breeders Lisa Beauprez, Thomas Bradbury and Thomas Bradbury, Jr. John Hammes trains the gelding. Ridden by Alfredo Triana, Jr., In Huh Hoots earned $23,556 to boost his career total to $60,478. He won the Cherry Creek Futurity at Arapahoe in June. Hammes also saddled third place finisher Who You Know for himself and Thomas Bradbury. Ridden by Stormy Smith, he earned $14,134 for the effort. Crazy At The Top, Mini Mink, Got Moves, First Domain, Bruce Allmty, Go Streak Lightning and First Math completed the field.